Trinity Designs: My Digital Studio - Learning to Love It! I know you all think that I've been off doing just the skating Mom thing this past three days - but hold on! I've been playing with my laptop, designing a scrapbook with My Digital Studio! Yes, it's true - I'm slowly but surely coming into the digital age and learning to love the possibilities of Digital Designing. Plus, it's really the only easy way to be creative while I'm on a long road trip. Where else am I going to get many hours one-way of mostly uninterrupted time in front of the computer learning this fantastic program?? Nowhere, so I'm taking advantage of it. I decided to start with a pre-designed 12" x 12" photo book template - Downtown Grunge, which I downloaded from my Stampin' Up! website. We'd had a fantastic time at the end of our Alaska trip last May, spending three days in Seattle, exploring the city for the first time ever. So I chose that small event as the focus of this scrapbook. I've always felt that when I'm scrapbooking an event, it's best to keep it to a narrow focus anyway so you don't get overwhelmed with the project. Believe it or not - My Digital Studio NOVICE that I am - I managed to complete 10 pages of this 24 page scrapbook in the 6 hours I worked on it in the car. If that sounds like a lot, understand that I'm truly a novice with most aspects of this program. The more I do on it though, the more I feel competent with it and the more I'm enjoying it. I was able to create a Custom Background paper with one of my photos of the Space Needle. It made a great backdrop for some photos of us at the top. 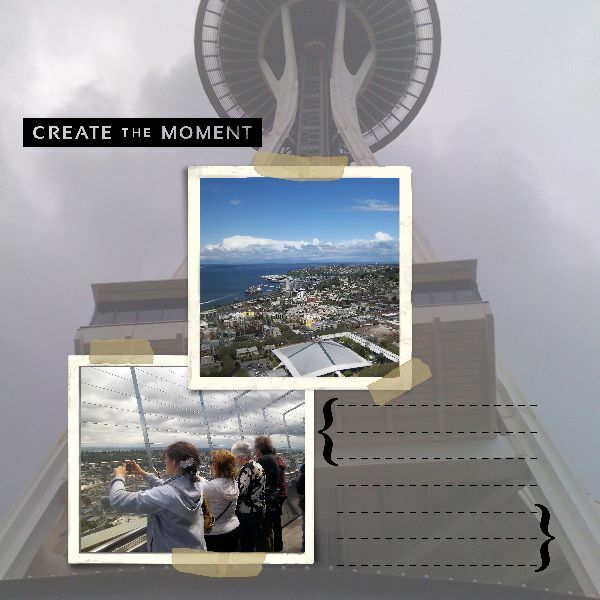 The photo blocks and digital tape came from the embellishments included in the Downtown Grunge Photobook Template. I used the Delight in the Day stamp brush set for the title and I took the journaling lines and brackets from other downloads - can't remember which ones now! My plan is to write my journaling in the book when it comes - I really prefer to hand journal, but that's just me. I really love how this page turned out and I can't WAIT to finish the book and get it printed! I'm planning to print one for Mark's mother too for Mother's Day since she enjoyed the trip with us. So, what do you think? Do you think it's cool? I'd love your feedback. Don't forget either that you can now download a FREE 30 Day trial of My Digital Studio from my Stampin' Up! website Products Page. You'll have full access to the basic program and many downloads, all the available downloads for purchase plus the professional printing services as well for a full 30 days. If you like it, you can choose to purchase the program by download in two different configurations. It's a great opportunity to try it out if you're not sure or a scaredy-cat like me. Trust me, if I can do it - YOU can do it! I absolutely LOVE this page, Robin! I'm so impressed!